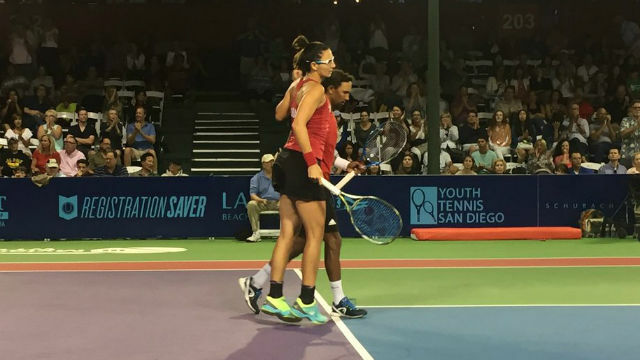 The San Diego Aviators bid for a second consecutive World TeamTennis title ended in a 22-18 loss to the Orange County Breakers in the finals Saturday evening at the Omni La Costa Resort & Spa in Carlsbad. Naomi Broady of the Aviators was a 5-2 loser to Yanina Wickmayer in the opening set, women’s singles. Broady and Darija Jurak defeated Wickmayer and Andreja Klepac, 5-3, in women’s doubles, the second set. Raven Klaasen and Rajeev Ram lost to Teymuraz Gabashvili and Ken Skupski, 5-2, in men’s doubles, increasing the Aviators deficit to 13-9. Klaasen and Jurak defeated Klepac and Skupski, 5-4, in mixed doubles, cutting the Breakers lead to 17-14 entering the final set. Gabashvili closed out the match with a 5-4 victory over Ram in men’s singles, winning the tiebreaker, 5-2, a day after being announced as the league’s male MVP. The Aviators defeated Orange County, 25-14, in last year’s final. Klaasen, the 2016 finals MVP, and Jurak, were the only Aviators to play in the 2016 and 2017 finals. The Breakers fielded an entirely new team. The teams tied for first in the six-team league with 9-5 records and split four matches against each other, with the home team winning each time. The Breakers were the top seed and designated as the home team because they won 79 games against the Aviators, losing 75. As the home team, Orange County determined the order of play.